There was much speculation, anticipation and doubt whether this favorite local climb would be included in the 2012 USA Pro Cycling Challenge. Yesterday at a local City Council meeting in Boulder, Colorado, the Boulder local organizing committee for Stage 6 of the USPCC informed the City Council of their planned stage route. 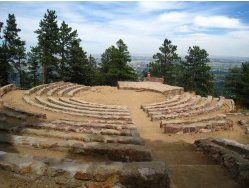 The big news - Stage 6 will finish at the flagpole near the amphitheater on Flagstaff Mountain. This is not the top of the climb or the top of the mountain, which means no Super Flagstaff (the steepest part of the climb). What is does mean is a pesky last climb for riders, and a chance for fans to walk up a scenic climb to watch the riders slow their pace (slightly) on a three and a half mile climb above town. This is no Alpe dHuez, this is more like a last berg (helligen). A press release this morning from the office of the USA Pro Cycling Challenge announced, "Spectators in Boulder will have the opportunity to see the riders multiple times, as they pass through downtown twice during Stage 6. The first pass will take place as the riders come into the city from Golden, and the second pass will happen later in the day as they return to downtown Boulder before heading up to Flagstaff Mountain. Large video screens, entertainment, hospitality and vendor booths will be set up in the heart of downtown on Pearl St., creating a festival atmosphere for fans. " South on Hwy 36 to climbs up Lefthand Canyon and over Lee Hill Rd. Another word for the city of Boulder, also sometimes called the Kingdom of Boulder. Could be used to describe the space between the ears of it's residents, but more accurately describes the geographical area contained within it's borders. I couldn't resist poking fun at Boulder with my Word of the Day series, but if you plan to come to Boulder to watch a bike race you will definitely read and hear this term. Boulderites (those who live in Boulder inside the Bubble) are known to rarely leave the border of their small homogenous everyone-looks-the-same city. They strongly believe their town is not only the best, but the only city for true cyclists to live and train. Those who live outside of Boulder have learned that bicycles exist in other parts of the world and people seem to be having just as much (actually more!) fun. But then I live in Denver, a 28-mile world-away from Boulder.